Let It Move You - There are a lot of ways to lose way and feel fit - some are just more fun!!! Join the Ultimate Dance-Fitness Party and beats a boring old workout any day. 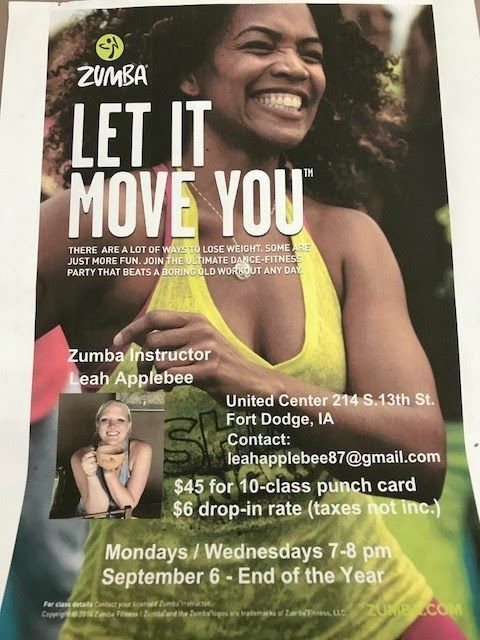 Second session of Zumba classes are starting at United. The second session begins the first week of September through the end of the year EVERY MONDAY AND WEDNESDAY NIGHT 7-8 P.M. The cost is $45 plus tax for a punch card with 10 classes on it or $6 plus tax for a drop in rate! Join us for some FUN!!! Register here through this site. See you for fun and fitness!